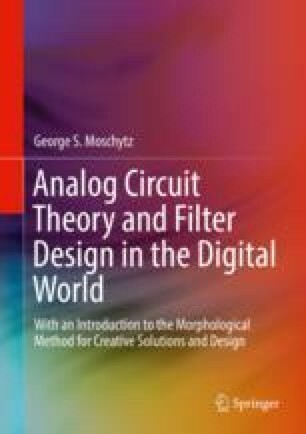 This chapter continues with the methodology of circuit design. Here, however, we are dealing with a general method of design which is known as morphological analysis (Wikipedia: “A method for systematically structuring and investigating the total set of relationships contained in multi-dimensional, usually non-quantifiable, problem complexes”). This method was developed by a Swiss/American physicist and inventor, Prof. Fritz Zwicky (1898–1974). It was successfully used by him in a variety of scientific and engineering fields ranging from astrophysics (discovery of “supernovae”) to the invention of airplane jet engines for takeoff on extremely short runways (so-called jato, i.e., “jet-assisted takeoff” system for aircraft carriers). Among many other areas of invention and problem-solving, the morphological method was also used by him after he was recruited as advisor to the US government in order to solve the myriad problems encountered in rebuilding Europe, physically and ideologically, after the destruction of WWII.